The National Marine Fisheries Service (NMFS or Fisheries Service) issued a permit to the Water Emergency Transportation Authority (WETA) on February 25, 2015, for proposed in-water dock construction activities at Alameda Point that may impact resident harbor seals. 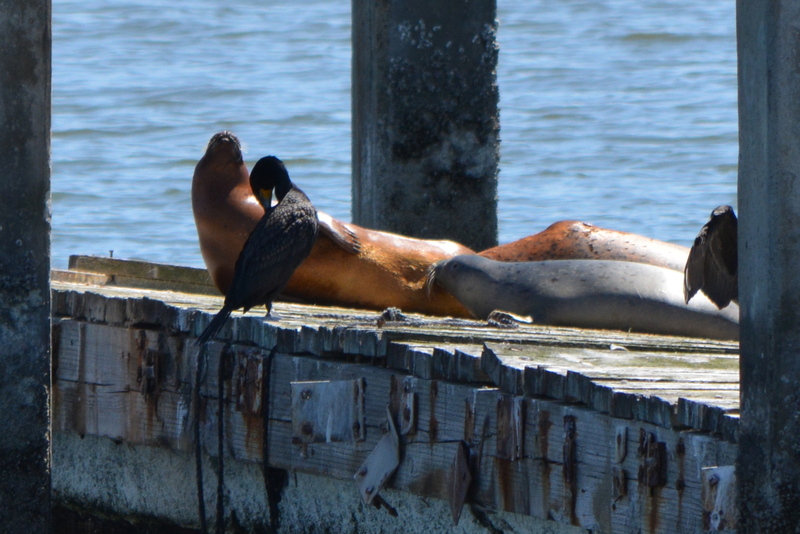 In its permit, they brushed off concerns of the Sierra Club, the San Francisco Bay Conservation and Development Commission (BCDC), and many residents that removal of the old dock used by harbor seals as a haul out could cause them to abandon the area. The Fisheries Service doesn’t seem bothered that the seals might abandon the area. They suggest the harbor seals could use a nearby rocky breakwater or a beach on Yerba Buena Island about four miles away. 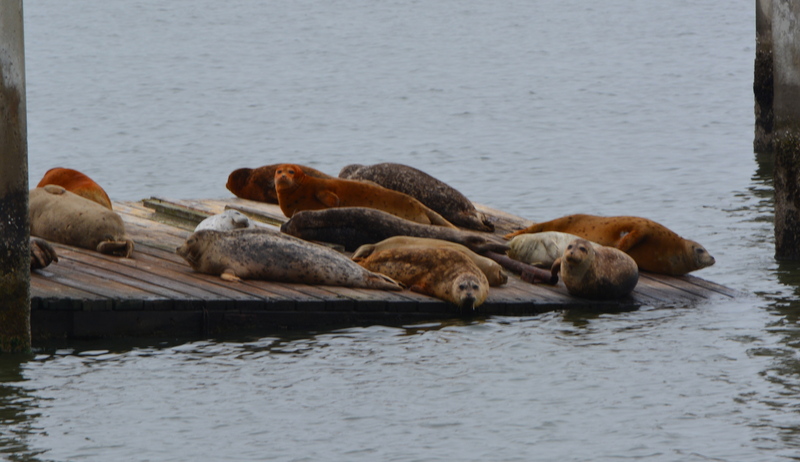 The Fisheries Service even went as far as belittling the dock structure and location preferred by the harbor seals as being “artificial” and “manmade,” even though examples of artificial wildlife habitat enhancements are widespread, some of them sanctioned by the Fisheries Service. Western tip of Breakwater Island where Fisheries Service said harbor seals should go. This city-owned property is ill-suited to raising seal pups and not inviting as a resting site, as evidenced by where the seals currently go. The one remaining beam moored to old dock – similar to log booms used by harbor seals elsewhere to haul out. No one suggested that conservation measures come “without maintenance.” Some periodic maintenance would obviously be necessary. If “manmade” artificial landscape features were poor conservation measures, then we would have to assume the Fisheries Service would not approve of fish ladders in rivers and streams to aid fish migration. Nor would they have approved of the artificial reef constructed off the coast of Texas using decommissioned and cleaned ships, and decommissioned oil rigs. A thriving marine reef habitat — through artificial means — has been the result. 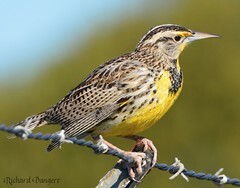 At Alameda Point, the entire least tern nesting site is artificial, from the imported sand, oyster shells, shelters and fence to the entire land mass underneath it created by filling in a marsh. Likewise, the least tern nesting island in the Hayward Shoreline marsh is artificially constructed and may someday be underwater. 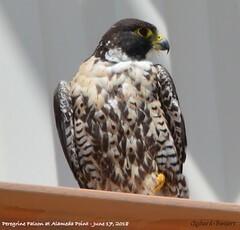 Both of these artificial sites are successful in aiding endangered birds by replacing habitat lost due to human development and uses. The Fisheries Service response to the comments on the impacts of the ferry maintenance facility gives the appearance of being out of touch. Instead of calling for a small mitigation measure in the form of a new haul out by the agency that is altering the ecosystem, they have shifted the burden to the harbor seals. This is backwards. 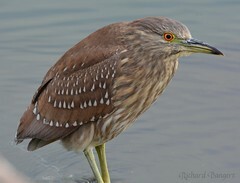 It sets the baseline conditions as “tomorrow” rather than “yesterday” before modern development ruined most of the shoreline habitat in the Bay. But there is still hope. 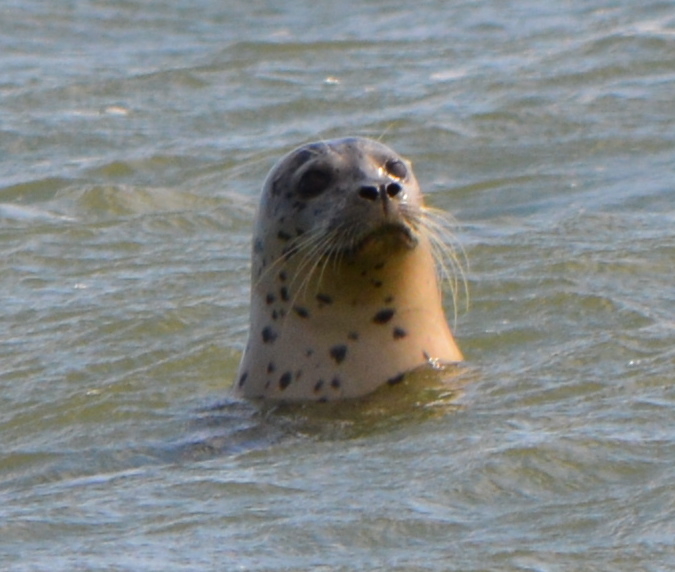 The Alameda City Council will have an opportunity at its Tuesday, March 3 meeting to rectify the pending lease agreement with WETA that fails to include provisions for the harbor seals. And a few weeks later, BCDC will have an opportunity to ensure that its permit for the project contains harbor seal haul-out requirements. 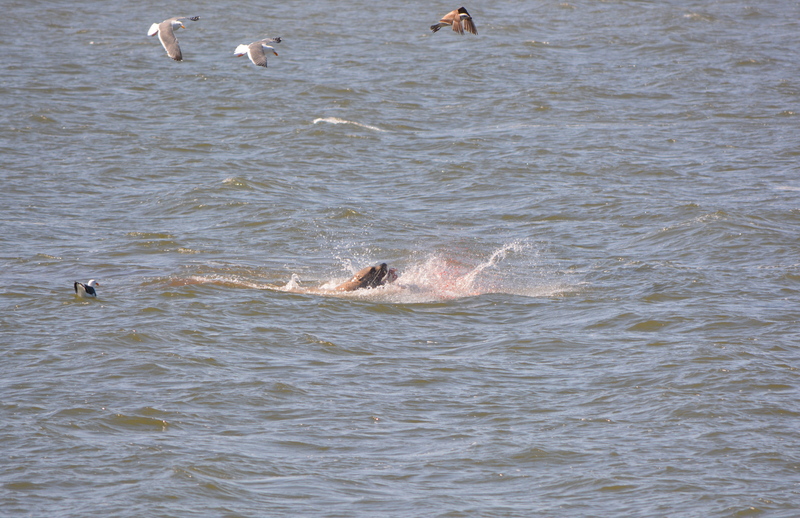 Harbor seal feeding on bat ray in Alameda Point Channel where new haul out could potentially be located. 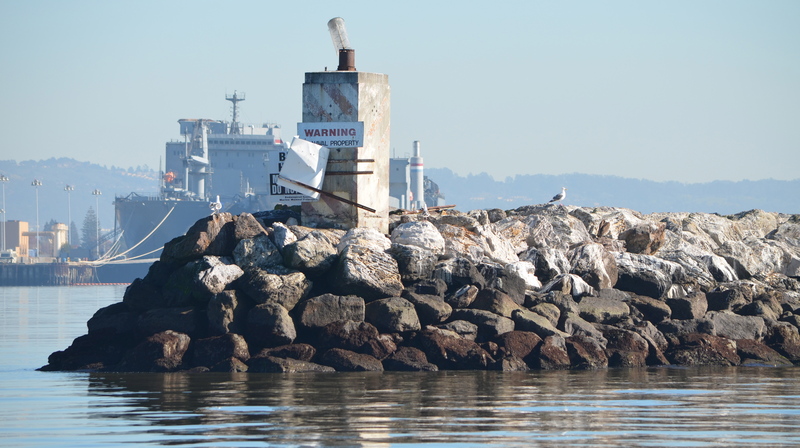 Breakwater Island landscape that Fisheries Service and city of Alameda say is suitable harbor seal haul-out habitat. 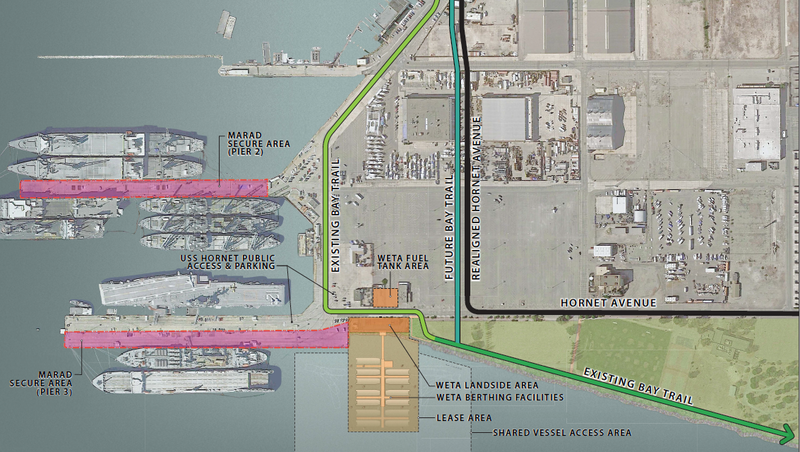 Construction of the ferry maintenance facility at Alameda Point is delayed another year. Originally scheduled to begin in August of this year, the project is on hold while the Water Emergency Transportation Authority (WETA) seeks a federal permit allowing for harassment of harbor seals during demolition and construction. 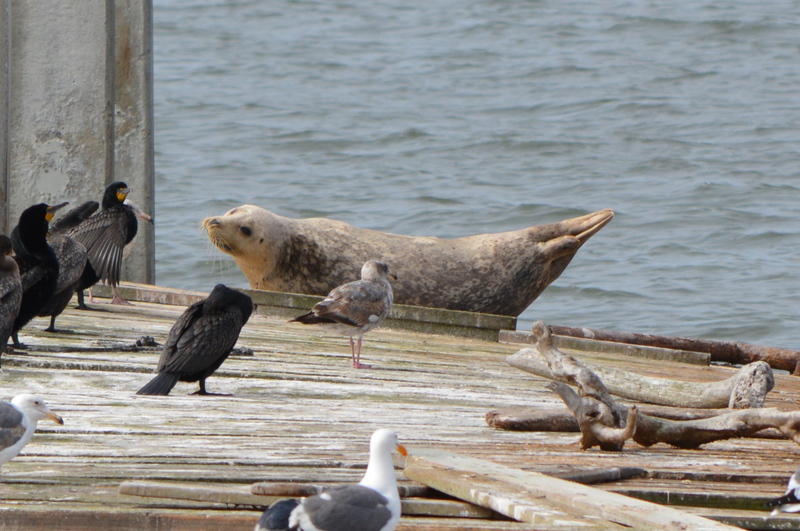 The public, beginning in January of 2014, raised concerns about the harbor seals being displaced at the project site. The Central Bay Operations and Maintenance Facility is slated for construction east of the USS Hornet where the Navy operated a recreational boating dock. 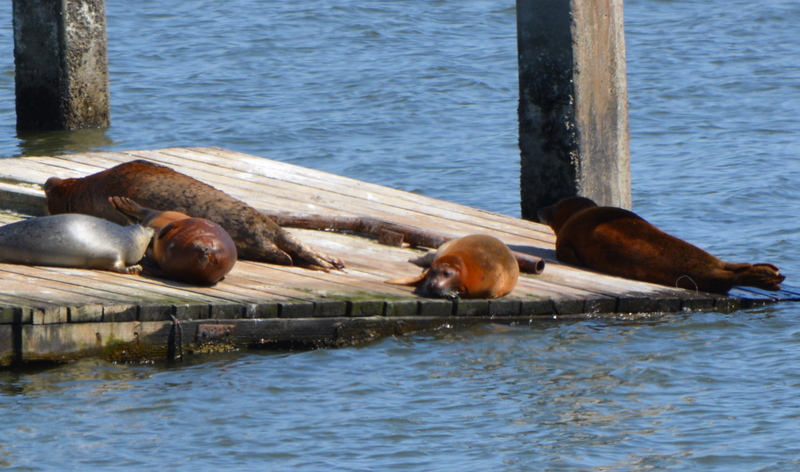 14 harbor seals resting on June 4, 2014, at Alameda Point dock where ferry facility is planned. 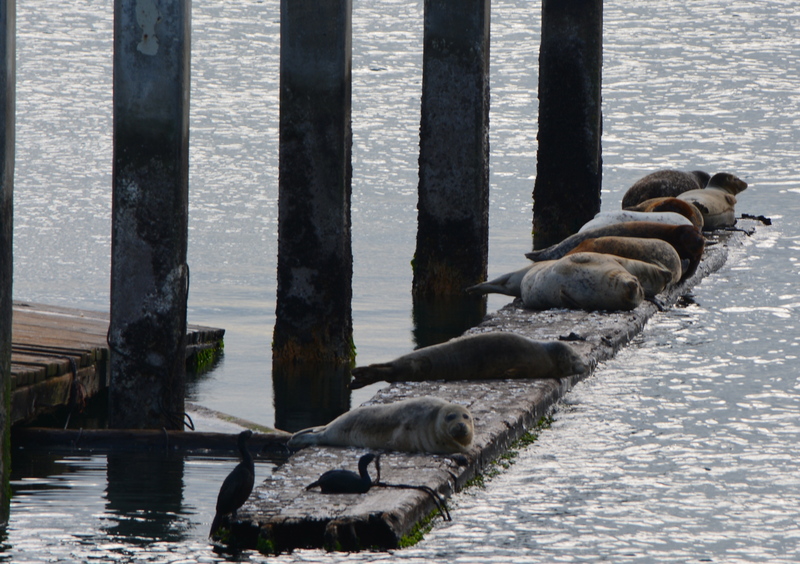 Part of the dock structure has sunk, but the main dock and remnant timbers have attracted harbor seals in recent years that manage to haul themselves up onto the wooden islands to rest. 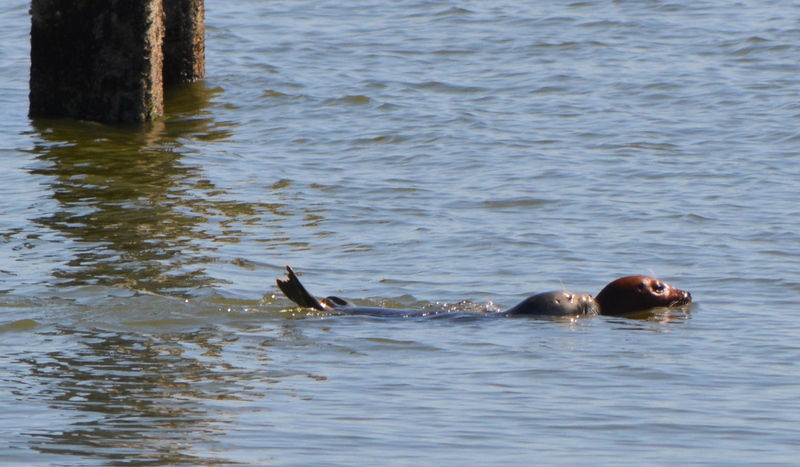 In May 2014, a female harbor seal was observed nursing a pup on the old dock and leading the pup in training exercises around the dock area. 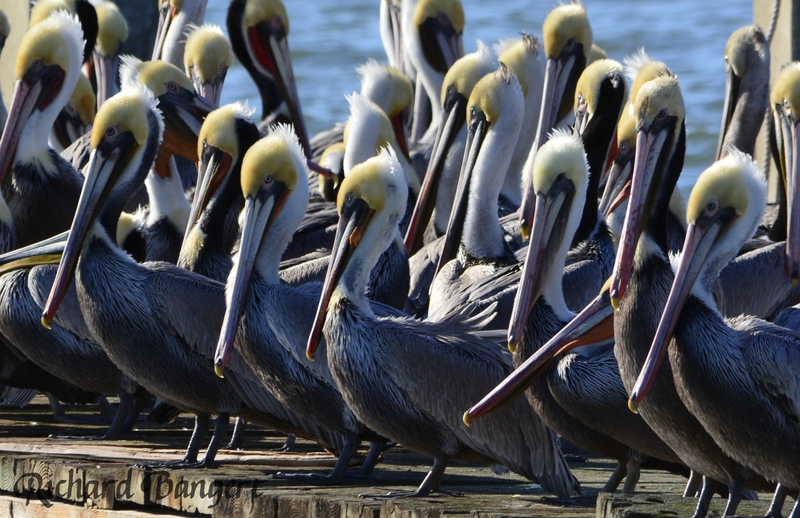 In its permit application published in the Federal Register on September 17, 2014, the description of the type of harassment for which WETA is seeking a permit is limited to sounds emitted during demolition of the existing pilings and hammering in new ones. The application makes only passing reference to residents having observed seals at the site. The loss of a resting site is not contemplated in the federal review, even though the Marine Mammal Protection Act lists habitat loss as a form of harassment. A haul-out resting site is considered habitat integral to the welfare of seals. The permit is being processed as part of a federal Environmental Assessment and is being prepared by the National Marine Fisheries Service (NMFS). The NMFS is an arm of the National Oceanic and Atmospheric Administration that enforces the Marine Mammal Protection Act (MMPA), as well as aquatic components of the Endangered Species Act. 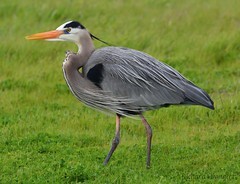 The permit being applied for by WETA is called an Incidental Harassment Authorization (IHA). An IHA “Level A” involves injury to a marine mammal. “Level B” involves disruption of behavioral patterns. The WETA permit is Level B. The preliminary conclusion of NMFS is that no significant impact will occur, especially in light of the acoustical mitigation measures worked out between WETA and NMFS. 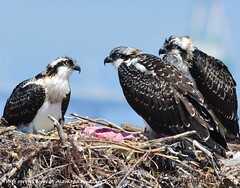 The mitigation measures call for gradual start-ups to demolition and dock construction work, a sound curtain in the water, and NMFS-approved biological monitors. Silver-colored harbor seal pup nursing on May 13, 2014. Despite the fact that a regular haul-out site will be eliminated with the dock removal, NMFS concludes, “No permanent impacts to marine mammal habitat are proposed to or would occur as a result of the proposed Project.” WETA’s proposed facility “would not modify the existing habitat. 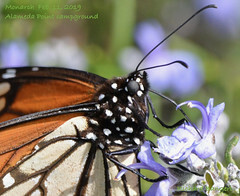 Therefore, no restoration of the habitat would be necessary,” stated NMFS. The public can submit comments no later than October 17, 2014. Pending review of the comments, the NMFS may impose additional mitigation measures. Comments can be sent via email to: itp.guan@noaa.gov. Paper mail to: Jolie Harrison, Chief, Permits and Conservation Division, Office of Protected Resources, National Marine Fisheries Service, 1315 East-West Highway, Silver Spring, MD 20910. 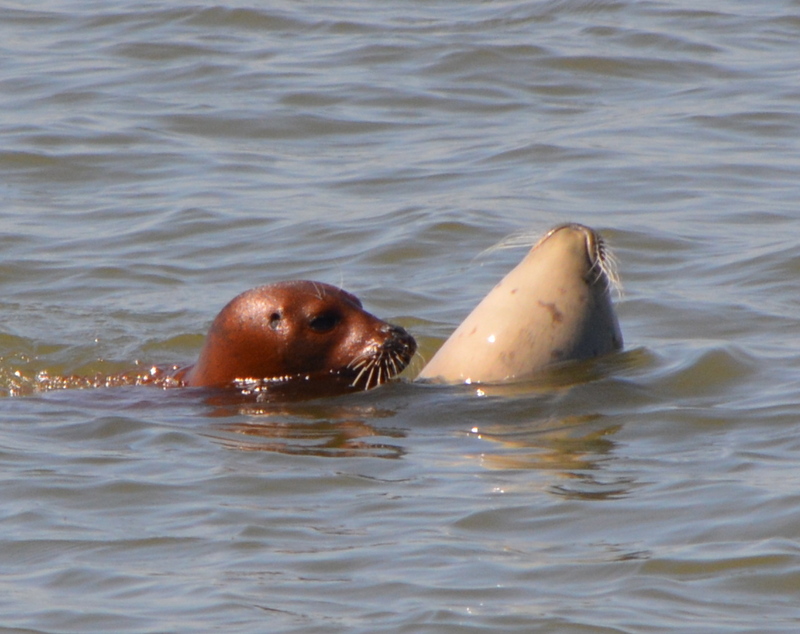 Adult harbor seal with pup at proposed ferry facility site, Alameda Point, May 13, 2014. 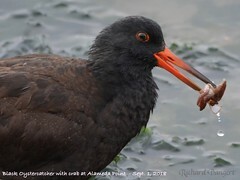 WETA will also need a permit from the Bay Conservation and Development Commission, which follows state rules regarding marine mammal impacts. WETA will be leasing the site from the city, and still needs to conclude a lease agreement and obtain a building permit. 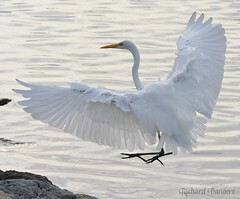 Demolition and dredging at the site can only occur between August 1 and November 30 due to foraging by least terns in the spring and summer and fish migration in late fall. The permit is for 2015. The project was authorized by WETA in 2009 and has been undergoing review ever since. It will include berths for 11 ferries, a service yard and a four-story workshop and administration building. The facility would also function as an emergency operation center for passenger service in the event of an emergency. 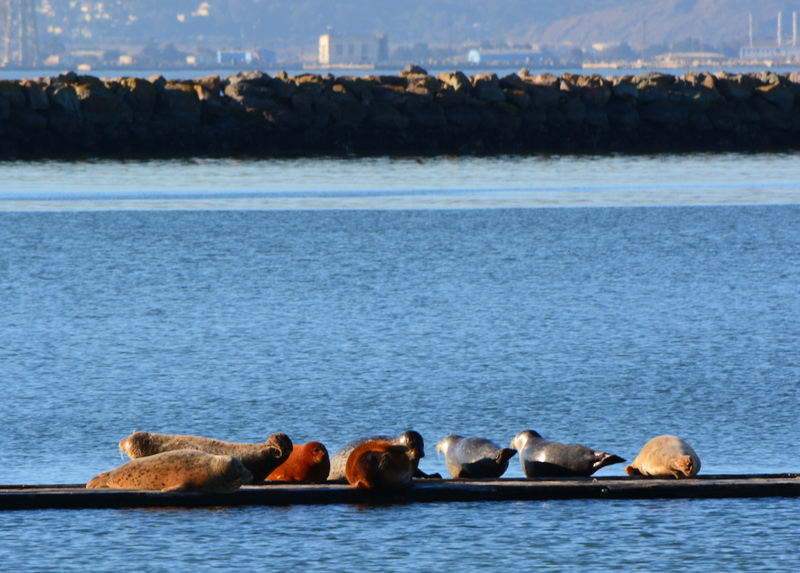 Harbor seals on dock remnant at Alameda Point, January 5, 2014. 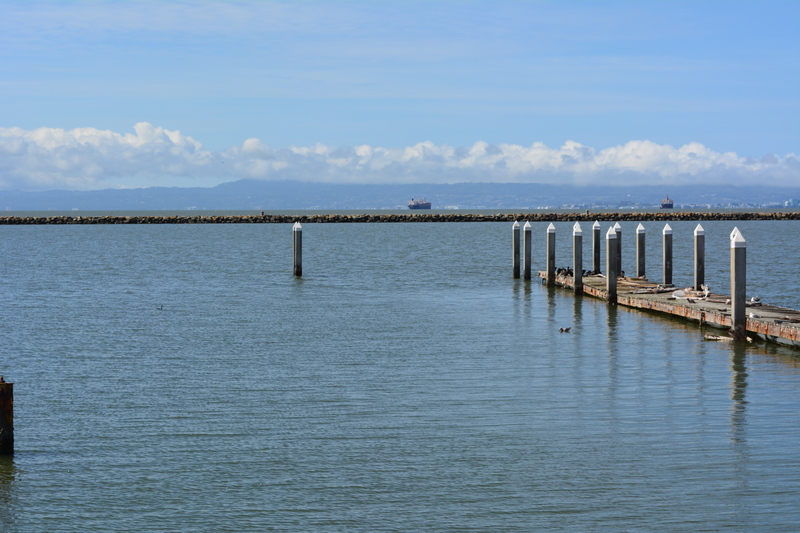 Recreational boating dock where harbor seals haul out, as it appeared on May 9, 2014. 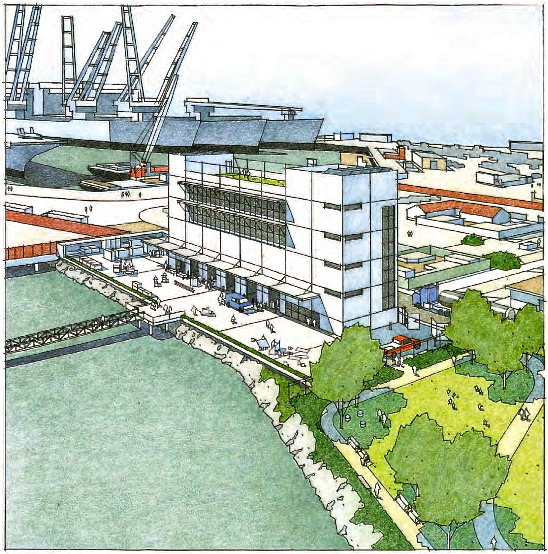 Proposed WETA ferry maintenance facility at Alameda Point.